Leading commercial vehicle accessory manufacturer, Rhino Products, have marked the next step in their ambitious European expansion plans by opening a distribution centre at Venlo-Grubbenvorst in The Netherlands. This 1.100 sq. m warehousing facility is now the headquarters for the Group’s European operations, alongside an existing warehouse in Mölnlycke, Sweden and a further sales office in Kraków, Poland. All manufacturing for the group takes place at their UK head office and production site in Deeside, Flintshire. The move to the distribution centre also coincided with Rhino switching to DPD as their central European logistics partner and has allowed the company to offer its customer base faster delivery times. All orders being dispatched to the Benelux region and Germany will be sent on a next day service while deliveries to the rest of Europe will arrive within 2-3 days. Rhino’s Group Managing Director Steve Egerton explained that “the distribution centre represents another step on the company’s journey to become the world leader in commercial vehicle accessories. We have invested over one million euros in this site, and we look forward to continuing our growth in Europe”. •	Rhino Products are Europe’s leading manufacturer of commercial vehicle accessories including roof racks, roof bars, access steps, ladder restraints and related accessories. •	With a comprehensive network of stockists, fitting centres, converters and online resellers throughout the UK and Europe, Rhino are a leading van accessory product supplier. •	The group’s head office is in Deeside in the UK where their 5.100 m2 manufacturing facility is also located. A brand new 8.100 m2 manufacturing site is under development at Ellesmere Port, Cheshire which will be opening in early 2019. 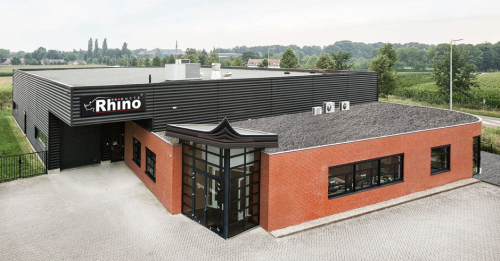 •	Rhino Products Europe has now moved to a 11.100 m2 headquarters in Venlo in the Netherlands which will include a dedicated distribution centre for central European regions. •	Rhino Products have European sites located in the Netherlands, Sweden and Poland. •	In 2017 the Rhino Products Group acquired AVS Steps Ltd, the leading provider of side access steps for taxis, minibuses, ambulances and mobility vehicles serving UK and international markets. This acquisition marked an exciting expansion of the Rhino Products range to develop additional offerings across the wider range of light commercial vehicle requirements. •	In 2018 Rhino Products were named as manufacturer of the year (turnover under £25m) at the Business Insider Made in Wales awards and have been automatically be shortlisted for the nationwide Made in the UK finals in 2019.